Decorate your fresh love bond with perfumed vigor by gifting your partner this Mirthful Bouquet of Flashing Blossoms and let honeyed sensation jingle in her core. 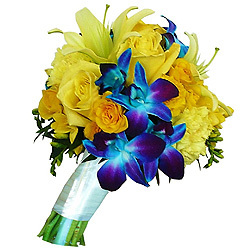 Various ecstatic Blossoms such as 2 Yellow Lilies, 3 Yellow Carnations, 1 Orchid and 5 Yellow Roses get featured in this Bouquet. Observe a special occasion involving you and your MR Perfect with the essence of passion ringing in both of your hearts by buying this Zesty Bouquet of Brilliant Blossoms for him. Various ecstatic Blossoms such as 2 Yellow Lilies, 3 Yellow Carnations, 1 Orchid and 5 Yellow Roses get featured in this Bouquet with Mini Cadbury Celebration.